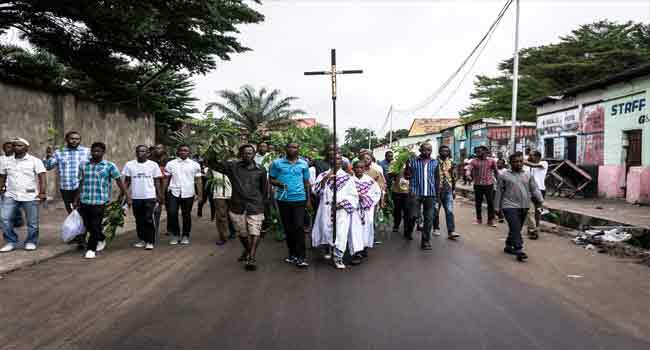 FILE PHOTO A man holds a Catholic cross as he takes part, with a group of Catholic faithfuls, in a demonstration outside the St Francois De Sales Church, during a protest called on by the Catholic Church, to push for the President of the Democratic Republic of the Congo, to step down on February 25, 2018 in Kinshasa. The powerful Catholic Church in the Democratic Republic of Congo has said it supports calls for a nationwide stoppage on Friday in response to a bloody crackdown on protests against President Joseph Kabila. An umbrella group of 10 pro-democracy groups have appealed for a “ghost town” protest, in which cities come to a standstill, over the deaths of two activists shot dead by police in demonstrations on February 25. A church-backed group called the Lay Coordination Committee (CLC) on Thursday said it “completely supported” the initiative. The deaths on February 25 added to 15 killings in marches on December 31 and January 21, according to UN and church figures. The three rallies, organised by the CLC, have thrown an international spotlight on the mounting tensions in the sprawling, deeply troubled central African nation. But he has controversially stayed on under laws enabling him to retain power until his successor is elected. The latest timetable to hold elections is for December 23 — a year later than scheduled under a December 31 2016 peace deal brokered by the church. But Kabila has refused to state clearly whether he intends to stand again. Fears have multiplied that the country, which experienced wars from 1996-97 and from 1998-2003, could explode into violence once more. On Wednesday, the UN’s envoy for the DRC, Leila Zerrougui warned the Security Council of the danger. “A failure to generate confidence in the full and faithful implementation of the December 31 agreement will only serve to heighten political tensions, and to fuel the risks of inciting violence for political ends,” said Zerrougui. In addition to a deepening political crisis, the DRC is struggling with armed conflict in its vast, resource-rich east, which is under the sway of rebel groups. The DRC is in the grip of a “shocking” humanitarian crisis with 4.5 million people in need of aid, the highest number in Africa, Zerrougui said.